Time flies like an arrow, but fruit flies like a banana. The Beatles learn to be brilliant in an hour and a half. An Englishman arrives back from Calcutta but refuses to adjust his watch. Beethoven has his symphonic wishes ignored. A US Senator begins a speech that will last for 25 hours. The horrors of war are frozen at the click of a camera. A woman designs a ten-hour clock and reinvents the calendar. Roger Bannister lives out the same four minutes over a lifetime. And a prince attempts to stop time in its tracks. 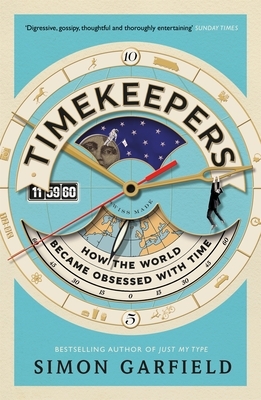 Timekeepers is a book about our obsession with time and our desire to measure it, control it, sell it, film it, perform it, immortalise it and make it meaningful. It has two simple intentions: to tell some illuminating stories, and to ask whether we have all gone completely nuts. Simon Garfield is the author of seventeen acclaimed books of non-fiction including A Notable Woman (as editor), To the Letter, On the Map, Just My Type and Mauve. His study of AIDS in Britain, The End of Innocence, won the Somerset Maugham Award.